Road travel is well developed in Japan. Whether on Expressways or on narrow, winding country roads, michi no ekis (road stations with farmer’s markets and parking lots where you can spend the night), convenience stores and vending machines are omnipresent. The latter are to be found pretty much on every corner of the road and even in the remotest of locations you will see solitary vending machines. They are always maintained and regularly stocked up, mostly on drinks. Over the course of six months, my partner and I drove through Japan’s four main islands from Kyushu in the south to Hokkaido in the north. We concluded it was impossible to drive more for than two hours without passing a major chainstore such as 7-Eleven, Lawson or Family Mart, or one of the smaller and sometimes regionally focused stores among which Cirkle-K, Mini Mart and Surkus. Many convenience stores, called konbini, are open 24/7. All stores have public bathrooms and a practical section selling toothbrushes, toilet paper, pens and papers, and the like. An additional convenience of the 7-Eleven is that their ATMs accept foreign credit and debit cards. But, most importantly, convenience stores sell food. The differences in their products on offer aren’t very great and what they have in common is that their food is tasty, fresh and very affordable. Let’s take a look at what the Japanese version is of the American hotdog, hamburger and peanut butter jelly sandwich. Onigiri are rice balls made of Japanese short grain, sticky rice. The translated name may be misleading as they come in different shapes. The Lawson brand has the advantage of onigiris coming with English translations on the package. The large variety of tastes includes a couple of good ones for vegetarians such as triangular onigiris wrapped in dried nori seaweed filled with pickled plum (called umeboshi), kombu, or vegetables, as well as osekihans – round rice balls steamed with red adzuki beans, or yaki onigiris that are grilled with butter and soy sauce. If you’re a meat and/or fish eater you have many more options. Enjoy onigiris filled with fish (e.g. salmon, roe or tuna with mayonnaise), shellfish (squid, shrimp) and meat (pork is a favorite). Some are eaten cold, others are tastier when hot. The latter is no problem as the stores always have a microwave. Not only are entire cookbooks devoted to these quintessential Japanese lunch boxes, independent bento shops can be found throughout the country. The dedication with which these dishes are prepared, presented and sometimes even elaborately packaged as a luxury gift, shows that bentos are not just about food but about art as well. Train stations and dedicated bento stores are among the places to look for the luxury packaged versions. Convenience stores stick to the basic packaging in plastic but the contents are diverse and tasty. 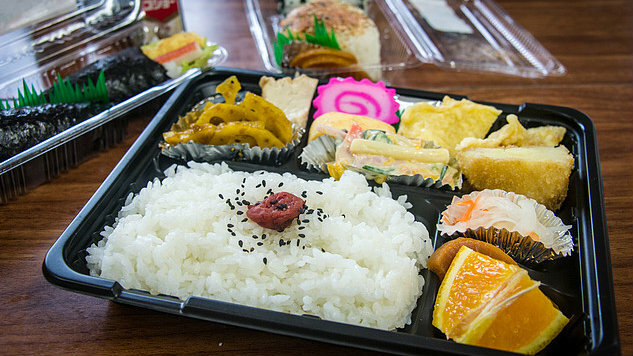 A typical bento consists of white rice with small servings of different pieces of fish and/or meat, and a variety of pickled, cooked and/or raw vegetables. While I have never found a bento made entirely without meat or fish, the meals may work for vegetarians as the different foods are compartmentalized and so the tastes do not mix. The store worker will heat the bento for you in the microwave but only few stores have a corner where you can eat nor do they have outdoor seating; expect to enjoy your meal in your car. A large section of one of the aisles will display a vast number of dried instant noodles. Additionally, the refrigerated section offers a selection of fresh soups as well. Take your pick from Japan’s popular Udong noodles, Soba or Ramen, all of which may include meat, fish, mushrooms, tofu and/or vegetables. You will get chopsticks and a napkin at the counter, and either the worker will heat the soup for you in the microwave or you can add hot water from the thermos that sits next to the coffee machine. While the Japanese cuisine offers a super selection of local, traditional foods and snacks on the go, western foods have found their way into convenience stores as well. There are sections with donut-type sweet treats and bread rolls, candy bars, chocolate bars as well as the typical western-type savory snacks such as potato chips and cellophane-wrapped sandos: sandwiches with ham, cheese, and/or egg. On the cashier’s counter is a glass case displaying western-type as well as Japanese hot food. Expect a selection of types of fried chicken (e.g. boneless, nuggets, and with bone) and steamed meat buns which are common Japanese hot snacks. In winter additional hot foods are sold, called oden. From a metal tray take your pick from food on skewers, such as tofu, radish (called daikon) fish cakes and boiled eggs, which is heated in dashi broth. Last but not least, drinks. Japanese drink very little soda and you won’t find a selection as large as you may find in Europe or North America. Apart from bottled water and some fruit juice, the stores mostly sell different brands of green tea and coffee in plastic or aluminum bottles, both sold as cold and hot drinks. The 7-Elevens and Lawsons sell good fresh coffee from machines that grind beans as you push the button. Paying a mere 100 yen for a small coffee to 180 yen for a big one (US $1 – $1.80) makes it very tempting to regularly take a break. Wherever you go in Japan, you’re sure to be caffeinated, hydrated and fed, even if by automatic machines. Happy and delicious travels in Japan!